View More In Foot Baths & Spas. Two great uses in one device - Ionic cleanse and far infrared belt (FIR)! ;User Friendly - includes three ionization intensity levels and time control. ;Operates at 15 Volts, 0-2.5 Amps and 45 Watts! ;Aluminum carrying case - nice professional appearance, prevents damage to foot bath system and helps to keep accessories organized. Two great uses in one device - Ionic cleanse and far infrared belt (FIR)! User Friendly - includes three ionization intensity levels and time control. Operates at 15 Volts, 0-2.5 Amps and 45 Watts! Aluminum carrying case - nice professional appearance, prevents damage to foot bath system and helps to keep accessories organized. If you have any questions about this product by ZEN LIVING IONICS, contact us by completing and submitting the form below. If you are looking for a specif part number, please include it with your message. 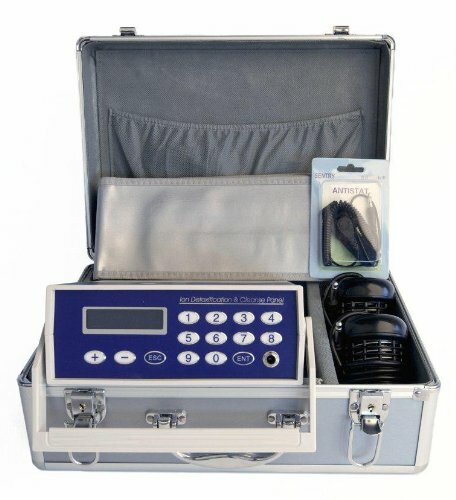 Ion Detox Ionic Detox Foot Bath Spa Chi Cleanse Unit for Home Use. TOP SELLER FOR HOME USE! FOOT SPA - New Improved Model for 2016 - Ionic Cleanse Detox Foot Bath - Spa Chi Cleanse Unit for Home Use. NEW ERGONOMIC FOOT BASIN. Spa Pedicure Liners 1200 PC Disposable Plastic Foot Spa Liners Sale BLUE Wholesale Liners for Pedicure Bowls.